"The decrease in immune response and increase in inflammatory activity that come with age can cause chronic inflammation, leading to a slow, but continuous production of free radicals and promoting wrinkles and sagging skin.IMMUNOCOLOGIE'S™ revolutionary Eye Treatment Serum contains VenoMAX™, a proprietary complex of anti-inflammatory ingredients that synergistically inhibits the activation of NF-kB, a key mediator in inflammation and aging. " The key ingredient in the eye serum is the "venomax" which like described above, will slow down the aging process around the eyes. It also contains Snow Algae, Alpine Rose and EAV (Elk Antler Velvet) All things I've never seen in an eye serum, or even heard of, but I'm just going to go with it, because I love this product. So whatever EAV is, it must be working! VenoMAX™ is a complex that mimics snake venom activity. Snake venom can be deadly – but similar substances can also heal!! The form of a “wrinkle killer”, this is a complex which mimics part of a polypeptide found in the venom of the Temple Viper. It has beneficial effects for the skin. Helps reduce the appearance of under eye puffiness and dark circles. Provides an immediate brightening effect. Protects the skin against chronic inflammation. I've only been using the Immunocologie Eye Treatment for about 4 days, and when I wake up in the morning my eye area has been looking so much better. My dark circles are gone and I look more awake and refreshed which is a surprise, since I've been dealing with a 3 month old and getting no sleep whatsover.. I can't say much for my crow's feet or fine lines except that they appear softer and less harsh. I think it is a bit too early to tell. 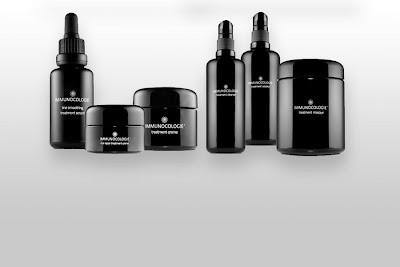 If you've been reading my blog for a while now, you will know I did a review on the Immunocologie Line Smoothing Treatment. Read more about it here. The eye treatment is very similar to the Line Smoother, they both actually work. The Line Smoothing Treatment works great for around my lips and chin. And for $150, well it should! Together, the eye and face serum, with continued use will not only make you look younger, but your skin will feel softer and appear brighter with a more even skin tone. And although it's not a miracle eye serum, the circles under my eyes have greatly diminished and the lines around my eyes are "softer". I know I said that earlier, but "softer" is the best way to explain how I look after only 4 days of use. Remember, your eyes can really make or break your face. When it comes to aging, you want your eyes to look youthful so it's important to take care of them. If you have the extra cash, or can afford the Venomax Eye Serum, I highly recommend trying it out. When you think about it, this eye serum is still cheaper then a trip to the doctor for botox, so instead of making that trip try out Immunocologie Eye Serum. I think you will be pleased with your results.